Jyothika Saravanan (née Jyothika Sadanah on 18 October 1977) is an Indian actress who predominantly appears in Tamil films. She also acted in some Kannada, Malayalam, Telugu and Hindi films. She debuted in Bollywood in the Hindi film Doli Saja Ke Rakhna, directed by Priyadarshan. She starred in her first Tamil film Vaali and her first Telugu film Tagore, opposite Chiranjeevi. Jyothika received critical praise for playing a Young Charming & Strong girl in Women-Centric Thriller Snegithiye , a blind woman in Perazhagan, Alter-egos Chandramukhi and Ganga in Chandramukhi, a Strong & Bold Characters in June R & Vettaiyadu Villaiyadu, A mute and deaf girl in Mozhi, a Negative Character in Pachaikili Muthucharam, a middle aged woman in 36 Vayadhinile and the role of a menacing, short-tempered and a bold cop in Naachiyaar. However, the turning point of her career came with the success of Vaali (1999) and Kushi (2000). At the peak of her career, she agreed to play the role of an antagonist in Pachaikili Muthucharam (2007). She received her first Filmfare Awards for Vaali as Filmfare Award for Best Female Debut – South. She was awarded the Filmfare Best Tamil Actress Award for Kushi. A string of successful films followed and gained prominence for her performances in Kushi, Dhool, Thenali, Thirumalai, Dumm Dumm Dumm, Snegithiye, Kaaka Kaaka, Perazhagan, Chandramukhi, June R, Pachaikili Muthucharam, Mozhi, 36 Vayadhinile, Magalir Mattum, Naachiyaar. Jyothika left the industry at the peak of her career marrying actor Suriya on 11 September 2006, after being engaged in a relationship for several years, and with whom she was paired in seven films. She won three Filmfare Awards, three Tamil Nadu State Film Awards, Dinakaran Awards, International Tamil Film Awards and other awards and nominations. She is also a recipient of the Kalaimamani Award. Jyothika was born to a Punjabi father and a Maharashtrian mother. Her father is Chander Sadanah, a film producer and her mother is Seema Sadanah. Actress Nagma is her half-sister. She completed her schooling in Learner's Academy, Mumbai. She later majored in Psychology at the Mithibai College in Mumbai. She also has a sister Roshini (born Radhika) and a brother Suraj, who is working as an assistant director for Priyadarshan. Jyothika married actor Suriya on 11 September 2006, with whom she was paired in seven films; Poovellam Kettuppar, Uyirile Kalanthathu, Kaakha Kaakha, Perazhagan, Maayavi, June R and Sillunu Oru Kaadhal. The couple has two children, daughter Diya (born 10 August 2007) and son Dev (born 7 June 2010). She made her acting debut in the Hindi film Doli Saja Ke Rakhna, directed by Priyadarshan, but it did not do well commercially. In a 2000 interview with India Today, Priyadarshan said that he "lapsed into depression" after the film flopped. Her first role was in Vaali (1999), for which she won Filmfare Award for Best Female Debut – South. and Dinakaran Best Female Debut Later that year, she starred in Poovellam Kettuppar, in which she played the love interest of the protagonist, portrayed by her husband Suriya. The success of the film Kushi became a turning point in her career. A string of successful films followed between 2000 and 2002, among them Mugavaree, Dum Dum Dum and Snegithiye. Her characters had equal importance as the hero. She also acted with Kamal Haasan during this period, in the comedy film Thenali. She was awarded the Filmfare Best Tamil Actress Award for her role in Kushi. Her role in Rhythm though small, has been widely appreciated. After the success of Kushi, she was signed to play the female lead in Friends, opposite Vijay, but she was replaced by Devayani. She collaborated with Mani Ratnam for the first time by appearing in his production house Madras Talkies' romantic comedy Dumm Dumm Dumm, alongside Madhavan. The film won positive acclaim and became a success not only in Tamil Nadu, but also in Andhra with its dubbed version. She also made an appearance in the Kannada film industry opposite Upendra in Nagarahavu. She had a dual role in this film. Later, she appeared in the Tamil thriller film Snegithiye, directed by Priyadarshan, made in all south languages. In 2003, she starred in Dhool with Vikram, Kaakha Kaakha with Suriya, Thirumalai with Vijay, all of which did well at the box office, Kaakha Kaakha, in particular, being one of the biggest hits of her career. She was listed amongst the Best Actress nominees in Filmfare Awards South for her roles in Dhool and Kaakha Kaakha. She got International Tamil Film Awards Special Jury For Best Actress. Dhool, Kaakha Kaakha and Thirumalai were amongst the top 10 films of the year and The Hindu wrote that she was "virtually the undisputed queen of Kollywood". Actor Vikram referred to her as Lady Kamal Haasan due to her dedication in acting. In 2004, she acted in a double role in the critically acclaimed Perazhagan, opposite Suriya. She won Tamil Nadu State Best Actress Award for the film. In 2005, she acted in Manmadhan, opposite Silambarasan. She also performed the lead female role in the Telugu film Tagore, opposite Chiranjeevi, which was screened at the International Indian Film Academy Awards, and was a commercial success. Her most successful film to date[when?] is the Rajinikanth-starrer Chandramukhi 2005, in which she played the title role. She won accolades for her performance in Chandramukhi including a Tamil Nadu State Film Awards and Filmfare Awards Nomination. She was also offered a chance to act with Mohanlal in Udayon, directed by Bhadran, but she could not do it due to busy schedules in Tamil. Her first release in 2006 was Saravana, opposite Silambarasan after Manmadhan. Her role in June R was noticed before the release of the film. Jyothika's performance is fine tuned and emotionally engaged. [according to whom?] She has underplayed her emotions beautifully. Her films in 2006 include Vettaiyadu Villaiyadu, a crime-thriller film written and directed by Gautham Menon and Sillunu Oru Kaadhal, opposite Suriya. The former was dubbed into Hindi as The Smart Hunt. Her last films were Gautham Menon's Pachaikili Muthucharam and the critically acclaimed Mozhi, both in 2007. Her roles in these two films, as a negative character in the former (which she played for the first time) and as a deaf and mute in the latter earned her widespread appreciation. Among these, Mozhi won her acclaim. Her performance took her very close to winning the National Film Award for Best Actress. However, she lost the award by a narrow margin at the end. In Pachaikili Muthucharam she had a crucial role and pulled off a memorable performance. Her Malayalam films Raakilipattu and Seetha Kalyanam were released in 2007 and 2009 respectively after languishing in development hell for years. Jyothika later made a comeback through television adverts. In 2008, she appeared in a short film Herova? Zerova?. The film was written and produced by her father-in-law Sivakumar and also starred Vijay, R. Madhavan and Suriya. Jyothika made her comeback to Tamil Cinema with 36 Vayadhinile, a remake of the hit Malayalam film How Old Are You?. 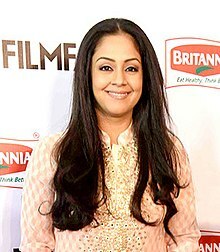 Jyothika received critical acclaim for her performance in the film as a middle-aged housewife who sets out to stand on her own. She was awarded the Filmfare Critics Award for Best Actress at the 63rd Filmfare Awards South. She also received Behindwoods Gold Medals For best Actress and Best Movie Award along with Suriya and also got many nominations for best actress. The film went on to become a moderate success at the box office. In the audio release of 36 Vayadhinile, and also at the successful release of the film Jyothika she credited Suriya, her husband, and some of her close friends as the major motivation for her comeback. Recently,[when?] in a Tamil TV show named Koffee with DD, Jyothika said that we can expect her in future as an artist, not as a heroine. Later in February 2016, director Bramma approached Jyothika to play the leading role in a "female-centric" script he had written and impressed by the offer, her husband Suriya agreed to finance the film. Jyothika subsequently participated in a series of workshops to get ready for her role in the film for twenty days. The movie is titled Magalir Mattum, written and directed by Bramma, in his second venture after Kuttram Kadithal (2015). It also features Saranya, Urvashi, Bhanupriya, Nassar and Livingston playing pivotal roles. Produced by Suriya, the venture began production in July 2016. She was also signed by Sri Thenandal Films for another project titled Mersal together in September 2016, opposite to Vijay, directed by Atlee A few days after the shoot began, Jyothika opted out of the project and the makers signed Nithya Menen to replace her. No official announcement is made so far about the replacement. In late February, Suriya confirmed Jyothika's new project, Naachiyaar by sharing the first look posters of the film. She got several accloades for her performance in Naachiyar as Rough and Riveting Cop. Deccan chronicle addressed her as "Lady Singham". As per behindwoods Jyothika is fantastic, as she masterfully plays the role of a menacing, short-tempered and a bold cop, with a gracious heart. Following the immense success of the film and Jyothika's big fan following in the Telugu speaking states The film Naachiyar has been dubbed into Telugu by the title 'Jhansi'. Jyothika agreed to portray a leading female role in Mani Ratnam's project titled Chekka Chivantha Vaanam in early September 2017, and confirmed her participation to the media while promoting Magalir Mattum (2017). She had earlier appeared in Mani Ratnam's production venture Dumm Dumm Dumm (2001), but stated her excitement at being selected in a film to be directed by him. In 2018, she appeared as the lead role of Chitra, a housewife to Arvind Swamy's character in Mani Ratnam's film Chekka Chivantha Vaanam. The first look was released on 21 August. The film has a worldwide release on the 27 September 2018. She was next seen as a housewife struggling to find her own identity in Kaatrin Mozhi, the Tamil remake of Vidya Balan's Tumhari Sulu. The project, which officially went on the floors on 4 June, was directed by Radha Mohan and marked his reunion with Jyothika after the critically acclaimed Mozhi. Jyothika's first Telugu entry as the lead female role was in the Telugu film Tagore, opposite Chiranjeevi, in which she played his wife. The film was screened at the International Indian Film Academy Awards, and was a commercial success. Though she debuted with Chiranjeevi in Telugu, her first Telugu film is One Two Three, which was a trilingual film. She acted along with Nagarjuna Akkineni in Mass, directed by debutant Raghava Lawrence. The film was dubbed into Tamil with the title Veeran, which also became a blockbuster and Hindi as Meri Jung–One Man Army. Her last film in Telugu was Shock, opposite to Ravi Teja. It was produced by Ram Gopal Varma. She was considered to act in the Telugu film Stalin, opposite Chiranjeevi. She was selected as the lead actress opposite Nagarjuna in Sri Ramadasu and Venkatsh in Lakshmi, but refused the offers due to her marriage preparations. She was asked to act along with Venkatesh again in Adavari Matalaku Ardhalu Verule. Jyothika opted out after signing the contract due to her wedding arrangements and it later came to the hands of Trisha Krishnan. Her film Mozhi was released in Telugu under the title Maataranai Mounamidi, which won critical accolades for her performance and was a commercial success. Jyothika has endorsed several brands such as Idhayam oil and Paragon footwear in the early 2000s. She was also the brand ambassador for RmKV silk sarees and Wardrobe Hub in Chennai. Later, she appeared in adverts for Aircel and Nescafé along with her husband Suriya. She has also endorsed Comfort, Saravana Stores and Santoor Soap. Jyotika has been announced as the Zee Tamil channel's first-ever Brand Ambassador, who features in the channel's extensive multi-media campaign as its voice. The unveil and launch happened on the iconic stage of Sa Re Ga Ma Pa Seniors with the entire family of stars from Zee Tamil in a grand ceremony celebrating the channels new look & feel and brand proposition. Jyothika along with actor Vivek (actor) have been appointed as ambassador for plastic free Tamil Nadu campaign by the State government under the leadership of Chief Minister Edappadi K. Palaniswami. ^ a b Jo Jo Jyothika ... – Jyothika – Suriya – Tamil Movie News. Behindwoods.com (18 October 2012). Retrieved on 12 December 2012. ^ "Jyothika receives critical acclaim". Screen. 10 February 2006. Archived from the original on 2 February 2013. Retrieved 7 May 2010. ^ "From 'bubbly' girl to foul-mouthed cop: How Jyothika is pushing boundaries". 15 January 2018. ^ "'June R' a tale of three women: Revathy -Bollywood interview Webindia123.com". www.webindia123.com. ^ "A film with Sarita, Khushboo, Jyothika". www.rediff.com. ^ "5 best performances of Jyothika -". in.bookmyshow.com. ^ "Top 10 Kollywood Actresses In A Negative Character Role - Nettv4u.com". ^ "Top Tamil Actresses In Bold, Negative Roles!". 19 February 2015. ^ `Pachaikili..` postponed!. Sify.com (Updated 7 February 2007). Retrieved on 14 August 2018. ^ "tamil box office collections tamil top ten films top 10 movies pokkiri thamirabarani paruthiveeran mozhi thiruvilayadal veyil deepavali pachaikili muthucharam veerasamy picture gallery images". www.behindwoods.com. ^ Rangan, Baradwaj (2008). "Gautam "Vasudev" Menon". Baradwaj Rangan. Retrieved 28 April 2011. ^ a b c d "Best Debutants down the years..." filmfare.com. Retrieved 23 January 2017. ^ a b "Jyothika Missed National Awards | News – General". Top 10 Cinema. 9 September 2009. Archived from the original on 29 May 2012. Retrieved 3 December 2011. ^ a b Kalaimamani Awards for 123 persons announced The Hindu, 15 February 2006. ^ "63rd Filmfare Awards (Tamil): And The Nominees Are..." Filmibeat. 8 June 2016. ^ a b "Jo misses National Award by a whisker!". Sify.com. 8 September 2009. Retrieved 3 December 2011. ^ "Jyothika – Nayanthara to Samantha: Top heroines of Tamil cinema – The Times of India". The Times of India. ^ Dundoo, Sangeetha Devi (7 March 2018). "Superstars Inc: When women rule the roost in Indian cinema" – via www.thehindu.com. ^ ""Suriya Never Stopped Me From Working Post Marriage," Says Jyotika". JFW. 29 March 2016. Retrieved 14 November 2018. ^ "A realistic touch". The Times of India. 2 September 2010. Archived from the original on 13 November 2018. Retrieved 13 November 2018. ^ "Highlights of Suriya-Jyothika wedding". Behindwoods.com. 11 September 2006. Retrieved 22 October 2009. ^ Settu Shankar (20 August 2007). "Bright light falls on Surya-Jyothika". One India. Archived from the original on 9 July 2012. Retrieved 22 October 2009. ^ "Priyadarshan: "People expect a lot from a commercial director"". India Today. 13 November 2000. I was so sure Doli Saja Ke Rakhna would do well, but when it didn't I lapsed into depression. ^ a b c "Dinakaran Cinema Awards – 1999". Dinakaran. Archived from the original on 25 June 2008. Retrieved 25 February 2014. ^ a b Slap in the face for Kamal. Rediff.com (18 August 2000). Retrieved on 12 December 2012. ^ "Hits and misses of the year that was". The Hindu. 19 January 2001. Retrieved 25 August 2012. ^ "Fighting her way to success". The Hindu. Chennai, India. 23 October 2002. ^ "Vishnuvardhan, Sudharani win Filmfare awards – The Times of India". The Times Of India. ^ "Trophy time for tinseldom". The Hindu. 24 March 2001. Retrieved 25 August 2012. ^ "Here's something 'new'". The Hindu. Chennai, India. 2 July 2004. ^ "We Rise fast, fall fast": Jyothika. Cinematoday2.itgo.com. Retrieved on 12 December 2012. ^ Friends. Cinematoday2.itgo.com. Retrieved on 12 December 2012. ^ Runaway success?. The Hindu (18 September 2002). Retrieved on 12 December 2012. ^ Telugu Cinema – Review – Dum Dum Dum – Madhavan, Jyotika – Mani Ratnam – Perumal – Karthik Raja – veturi. Idlebrain.com (21 September 2001). Retrieved on 12 December 2012. ^ a b Nagarahavu Cast & Crew, Nagarahavu Star Cast, Actor, Actress, Director. entertainment.oneindia.in. Retrieved on 12 December 2012. ^ The dancing brush. Rediff.com (11 August 2000). Retrieved on 12 December 2012. ^ Ladies Only. Rediff.com (31 March 2000). Retrieved on 12 December 2012. ^ Reel of fortune. The Hindu (29 December 2003). Retrieved on 28 December 2013. ^ "tamil movie site". Reocities.com. Retrieved 6 August 2012. ^ "Welcome to". Sify.com. 20 January 2007. Retrieved 18 October 2011. ^ a b "Tagore". IBOS. Retrieved 12 December 2010. ^ "Chandramukhi is a certain hit!". Ia.rediff.com. 14 April 2005. Archived from the original on 25 September 2014. Retrieved 4 August 2012. ^ "Tamilnadu govt awards Rajini and Kamal". cinesouth.com. Archived from the original on 11 September 2007. Retrieved 20 October 2009. ^ "Jo is the new `Chandramukhi`". Sify.com. 18 November 2004. Archived from the original on 25 September 2014. Retrieved 14 October 2011. ^ "Saravana Movie Review". indiaglitz.com. 14 January 2004. Retrieved 20 December 2011. ^ Metro Plus Chennai / Cinema : Hits all the way. The Hindu (28 July 2005). Retrieved on 12 December 2012. ^ June R Tamil Movie Review – cinema preview stills gallery trailer video clips showtimes. IndiaGlitz (14 February 2006). Retrieved on 12 December 2012. ^ June R Review – Tamil Movie Review by P.V. Sathish Kumar. Nowrunning.com (5 July 2005). Retrieved on 12 December 2012. ^ Rangan, Baradwaj. "Review – Mumbai Xpress". desipundit.com. Retrieved 9 January 2008. ^ "No remake for Vettaiyadu Villaiyadu". The Times Of India. 19 March 2012. ^ Box office – 3 (Feb 23rd to March 2nd). Behindwoods.com (26 November 2006). Retrieved on 12 December 2012. ^ "`I don't write scripts for heroes`". Sify. 2006. Retrieved 28 April 2011. ^ Howzzat? Priyan film releases and goes unnoticed! – Malayalam Movie News. IndiaGlitz (15 January 2007). Retrieved on 12 December 2012. ^ Friendship Bollywood Movie Preview, Synopsis – Bollywood movie Friendship Preview, Synopsis. Nowrunning.com. Retrieved on 12 December 2012. ^ "சரவணா ஸ்டோர்ஸ் சட்டையைத்தான் இனி சூர்யாவும் போடுவாரா?". sivajitv.com. Archived from the original on 13 February 2012. Retrieved 15 June 2010. ^ "Events – Herova? Zerova? Educational Awareness Campaign". IndiaGlitz. 16 May 2008. Retrieved 26 February 2011. ^ "Never regretted quitting: Jyothika". Deccan Chronicle. 11 May 2015. ^ a b Jyothika’s movie with Bramma begins today. Sify.com (Updated 14 July 2016). Retrieved on 14 August 2018. ^ Jyothika attends workshop for Bramma`s next film!. Sify.com (Updated 9 July 2016). Retrieved on 14 August 2018. ^ Vijay 61: Sri Thenandal Films confirms producing Ilayathalapathy, Atlee's film. IBTimes India (19 October 2016). Retrieved on 2018-08-14. ^ Ilayathalapathy Vijay to romance Kajal, Samantha, Jyothika in his next – Movies News. Indiatoday.intoday.in (1 February 2017). Retrieved on 2018-08-14. ^ Sri Thenandal Films officially announces the cast and crew details about Vijay 61. Behindwoods.com (31 January 2017). Retrieved on 2018-08-14. ^ Nithya Menen replaces Jyothika in `Thalapathy 61`. Sify.com (Updated 6 February 2017). Retrieved on 14 August 2018. ^ "First look of Jyothika-Bala film". The Times of India. 28 February 2017. Retrieved 1 March 2017. ^ "Naachiyaar movie review: 'Lady Singham' Jyothika's fearless act steals the show". 17 February 2018. ^ "Naachiyaar (aka) Naachiyar review". Behindwoods. ^ "Naachiyaar movie review: This riveting Jyothika, GV Prakash starrer will keep you hooked till the end- Entertainment News, Firstpost". ^ "Actress Jyothika as Jhansi". telugucinema.com. 14 July 2018. ^ "Jyothika as Jhansi in the Telugu dubbed version of Bala's 'Naachiyaar'". 16 July 2018. ^ Back to. "Jyothika on why she chose to return with Magalir Mattum: 'For two years, no scripts excited me'- Entertainment News, Firstpost". Firstpost.com. Retrieved 10 February 2018. ^ "Jyothika will join the star cast of Mani Ratnam's film". The Indian Express. 8 September 2017. Retrieved 10 February 2018. ^ It's official! Mani Ratnam's next to star Jyothika, Simbu, Vijay Sethupathi, Fahadh Faasil – Movies News. Indiatoday.intoday.in (16 September 2017). Retrieved on 2018-08-14. ^ "Cast for Mani Ratnam's next announced". The News Minute. 16 September 2017. Retrieved 18 September 2017. ^ Jyothika signs Mani Ratnam's Tamil-Telugu bilingual. The New Indian Express (8 September 2017). Retrieved on 2018-08-14. ^ "Title for Tamil remake of 'Tumhari Sulu' revealed". 21 April 2018. ^ "'Tumhari Sulu' Tamil remake: Jyothika and Vidharth to be lead pair". 14 April 2018. ^ "Kaatrin Mozhi: Tamil remake of Tumhari Sulu starring Jyothika starts shoot; film aims for October release- Entertainment News, Firstpost". ^ Scroll Staff (20 April 2018). "Jyotika's 'Tumhari Sulu' Tamil remake titled 'Kaatrin Mozhi'". Scroll.in. Retrieved 25 July 2018. ^ "Telugu Cinema – Review – 123 – One Two Three – Prabhu Deva, Jyothika, Nagendra Prasad, Raju Sundaram". www.idlebrain.com. Retrieved 23 January 2017. ^ "'Shock' Audio Launch". IndiaGlitz. Retrieved 23 January 2017. ^ "Shock Cast & Crew, Shock Telugu Movie Cast, Actor, Actress, Director – Filmibeat". FilmiBeat. Retrieved 23 January 2017. ^ "Trisha is Chiru's choice!". Sify. Retrieved 23 January 2017. ^ "Telugu Movies". Retrieved 30 May 2017. ^ "Jyothica missed acting opposite Venkatesh". Archived from the original on 7 December 2016. ^ "Tamil hit Mozhi as Maatarani Mounamidi in Telugu". indiaglitz.com. Retrieved 24 September 2015. ^ "Married Aunty As Balayya's Heroine?". ^ "'close Up' Suriya – Suriya – Tamil Movie News". Behindwoods.com. 29 April 2011. Retrieved 3 December 2011. ^ "Zee Tamil undergoes brand refresh, ropes in actress Jyotika as brand ambassador – TelevisionPost: Latest News, India's Television, Cable, DTH, TRAI". www.televisionpost.com. ^ a b 49th Annual Filmfare Awards – South Archived 19 April 2015 at the Wayback Machine. Downloads.movies.indiatimes.com. Retrieved on 24 June 2013. ^ "Tamilnadu State Film Awards – awards for Vikram, Jyotika". cinesouth.com. Retrieved 20 October 2009. ^ "Film fans association honours artistes, technicians". The Hindu. 18 September 2006. Archived from the original on 26 September 2014. Retrieved 19 April 2014. ^ "Anniyan & Chandramukhi walks away with honors". Behindwoods. 7 August 2006. Archived from the original on 26 September 2014. Retrieved 19 April 2014. ^ a b "Jyothika". IMDb. ^ a b "Tamil nominations for the 65th Jio Filmfare Awards (South) 2018 – Times of India". ^ "Tamil movies :Jyotika does a short film". Behindwoods.com. 12 January 2006. Retrieved 25 August 2012. ^ Jyotika is Zee Tamil brand ambassador. Times of India (16 October 2017). Retrieved on 14 August 2018. ^ Actor Jyothika to endorse Zee Tamil, Marketing & Advertising News, ET BrandEquity. Brandequity.economictimes.indiatimes.com (16 October 2017). Retrieved on 2018-08-14. ^ a b "Winners of behindwoods gold medals 2015". Behindwoods. Retrieved 13 October 2016. ^ Iyengar, Aarti. (28 August 2015) Most desirable married women of Kollywood. Timesofindia.indiatimes.com. Retrieved on 2018-08-14. ^ James, Anu (8 November 2017). "JFW Awards 2017: Jyothika gets emotional on women behind her; Diya's fan moment with Mithali Raj [Videos]". ibtimes.co.in. ^ "JFW Awards 2017 set for a glitzy night". Deccan Chronicle. 21 September 2017. ^ "Mom told me to have money so I can walk out of an unhappy relationship: Jyothika". thenewsminute.com. 8 November 2017. ^ "அவள் விருதுகள் – சாதனைப் பெண்களின் சங்கமம் – Aval Vikatan Awards for successful women – Aval Vikatan – அவள் விகடன்". vikatan.com. 6 March 2018. ^ Vikatan Group announces "Aval Awards" as part of their women empowerment Initiative – TVNews4u. DailyHunt.in (14 March 2018). Retrieved on 2018-08-14. This page was last edited on 21 April 2019, at 21:43 (UTC).